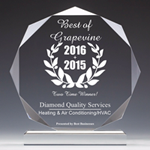 Common indicators of poor airflow causing unusually hot-cold spots or a clammy feeling in specific areas within a conditioned space, almost always stem from a lack of return air ducts, as well as kinked-crimped or sphagetti-like ductwork, improperly installed and unsupported. This normally translates into reduced air quality, reduced efficiency and seasonal inconsistencies of conditioned air comfort. 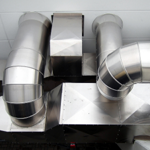 The problems derived of poor duct system performance are often linked to an inadequate or disproportionate supply of conditioned air throughout all areas of a conditioned space such as a home. Other issues of unfiltered air from sealing failures combine and add up to a significant loss of energy efficiency, air quality and shorten mechanical system life. Most often, inadequate air distribution, poor filtration and sealing failures create abnormally humid conditions within the heating-cooling mechanical and duct system network. If left uncorrected, these conditions promote indoor air discomfort as well as microbial growth. Ultimately premature system failure. Whether you are considering a high efficiency two speed zoned system or a renewal of the existing, the proper amount of return air flow, proper duct routing and support, good filtration and system sealing will add comfort, increased efficiency and air quality. When properly maintained this will lengthen the service life of any system.